Red-Tailed Hawk (Buteo jamaicensis) A large, stocky hawk with broad and fairly rounded wings, and a wingspan of about 4ft. Plumage is extremely variable in pattern and amount of dark; at least 4 light morph (variety) and 3 dark morph subgroups have been identified, with color phases ranging from pale, to "normal," to reddish, to dark; all of these interbreed, so individual variation in this one species of hawk is enormous. Sexes are similar in appearance, with much size overlap, but females are generally larger. The reddish tail of the adult is distinctive to this species, but juvenile birds (and some color morphs) lack this feature. Most adults have a belly band of dark streaks on white underparts. Another identifying point common to all subgroups is a dark mark on the leading edge of the underwing, visible in flight. This is the most common and widespread hawk in North America - and also has the most variable pattern of plumage of all hawk species on the continent. Capt. Andy was found down on the highway after being hit by a car. He had severe head trauma and lost his left eye. He is non-releasable due to his permanent eye injury. He is permitted to Lila Arnold who holds both state and federal permits to possess for educational purposes. Size Male/Female Length 18.0 - 22.5" 20.5 - 25.0" Wing Span < 45" 48 - 54" Weight 1.7 - 2.4 lb. 2.0 - 3.1 lb. Status - State and federally protected. 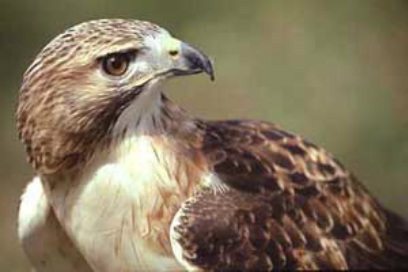 Habitat - Lives in coniferous to mixed and deciduous woodland, prairies, woodlots, fields and roadsides, to saguaros and tropical rainforests; lives at all elevations from sea level to 9,000 ft. Habitat for this hawk is extremely variable -- as are its hunting habits and its plumage, which are designed to take advantage of each particular habitat and way of making a living. Diet - Over 85% of the diet consists of rodents, but this hawk is a very opportunistic hunter and will eat other mammals, birds, reptiles, amphibians, and insects. Primary hunting style is to perch and wait; frequently seen on a conspicuous roadside tree or fencepost. This hawk most often hunts from a perch at wood's edge, but can also hunt in more open or forested areas. Other common hunting styles are soaring at high altitude for prey (and to announce territorial ownership), and hover hunting. Call - A loud, wheezing, descending kkeeeeerr is the most common call of this sturdy hawk. Nesting - Prefers nesting in a tall, open-crowned tree with good views and access to suitable hunting grounds, usually in open woodland or forest edges. Builds a bulky twig and stick nest, lining it with greenery and strips of bark; often builds on an old nest, and may alternate between several perennial nests. Most Common Problems - Collision with vehicles; also gunshot, electrocution, hitting power lines, barbed wire fences, poisoning and leg-hold traps.